Metallic Robot Platforms - 3D Print Prototypes d.o.o. Metallic Robot Platforms There is	1 product. 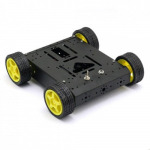 Short Description : 2012 latest 4WD aluminum mobile robot platform.